No booking fees if booked through our website. Fees will apply if booked through Airbnb, Flipkey, HomeAway, etc. This amount will be charged if any damages occur. This is a pre-paid and non-cancellable rate. Once your reservation is confirmed, cancellations or changes are not allowed (including changes to the guest's information). No refunds or credits for early departure, cancellation or no-show. It requires full pre-payment for the entire stay and is fully non-refundable. Your credit card will be charged for the total amount within 24 - 48 hours of booking. 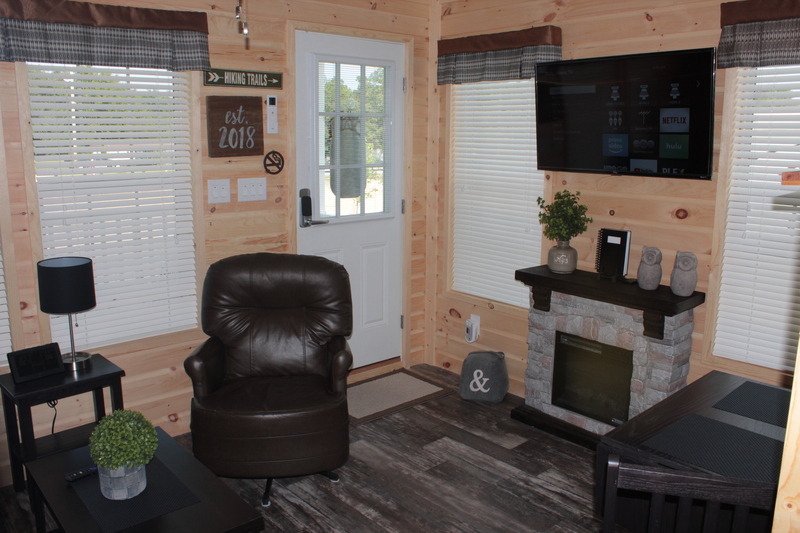 Our romantic & modern, smoke-free tiny house cabin, was built recently in July 2018. 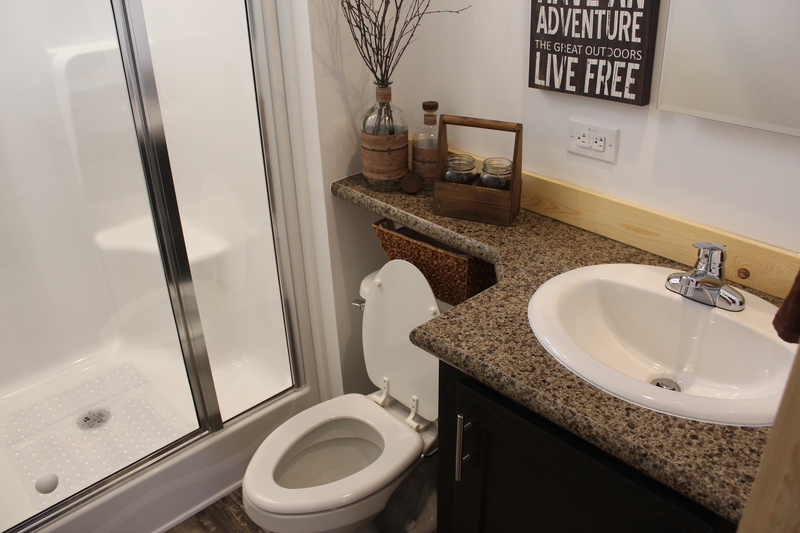 With 2 bedrooms, a full kitchen & living room including an HDTVs with local channels, Netflix, Amazon Video. Free WiFi included. 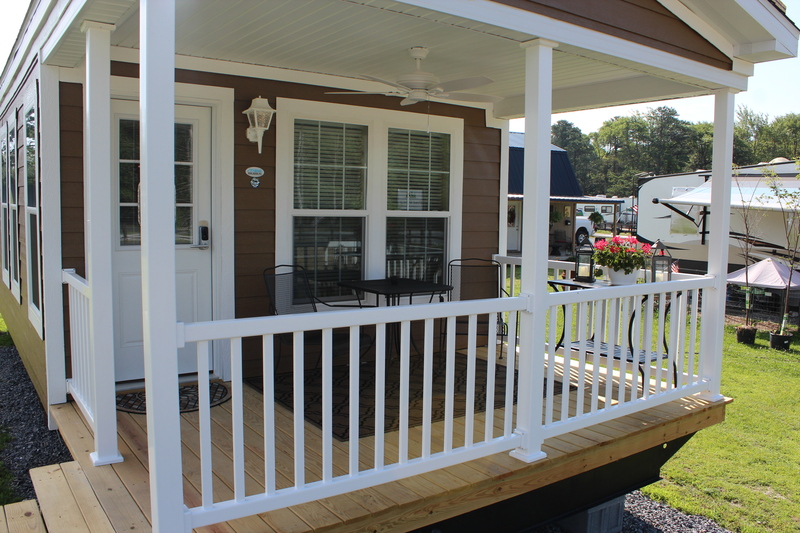 Outside deck with gas grill, fire pit, & a picnic table too! 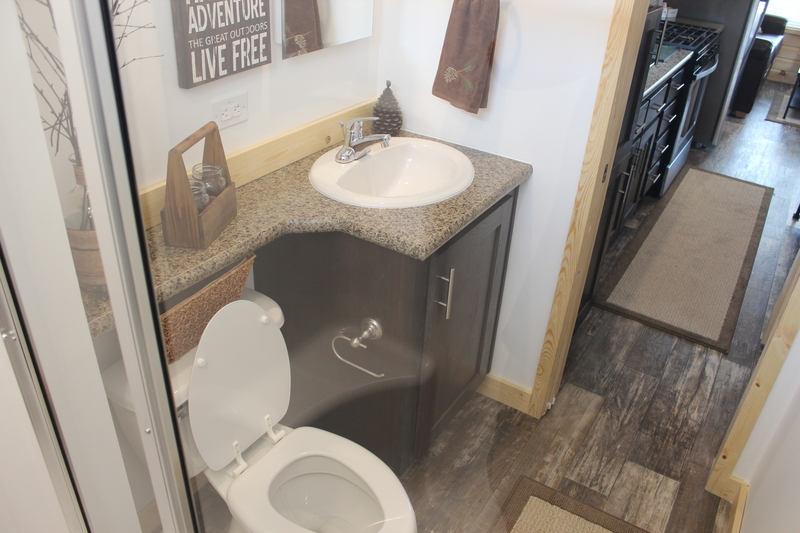 Our modern tiny house cabin is small but packed with lots of modern amenities. Located on 17.5+ acres of private campground property & boarding state game lands, and the Appalachian Trail makes our location very unique. We are just a few miles from Fuller & Laurel Lake, & Long Pine Run Reservoir for kayaking and fishing. 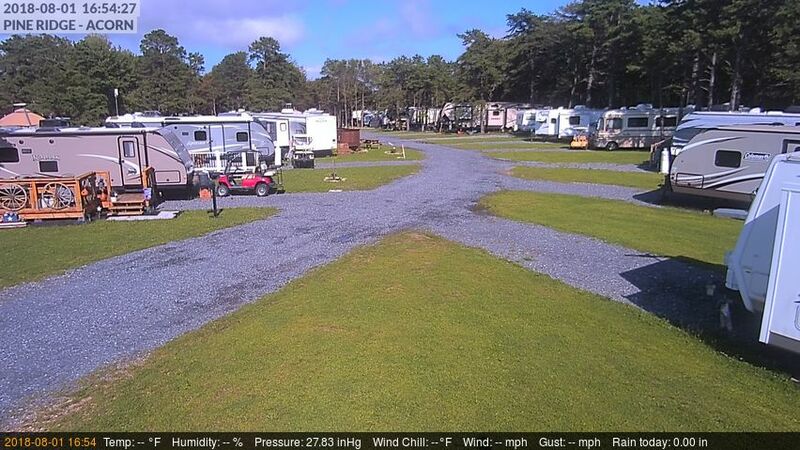 Camping is fantastic at this location with a fire pit close by, picnic table, and outside grill with many open acres for your activities. 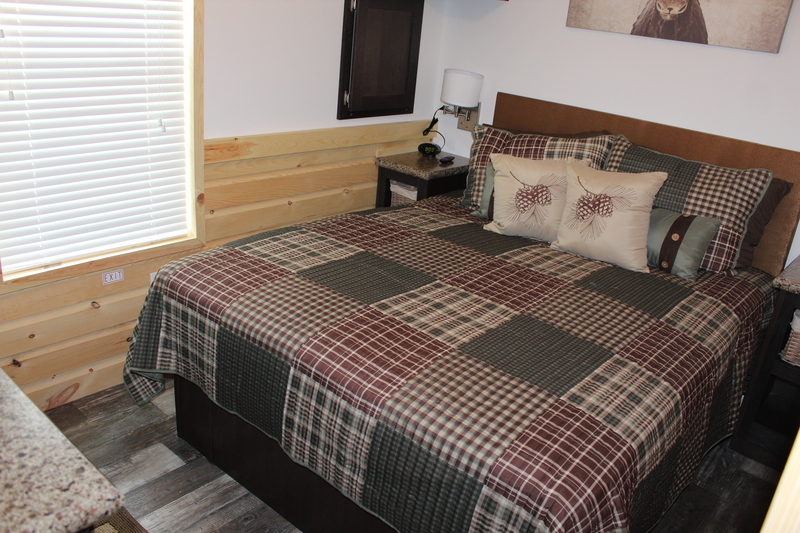 Our cabin is located in a campground, so some action is to be expected on the property with close neighbors. 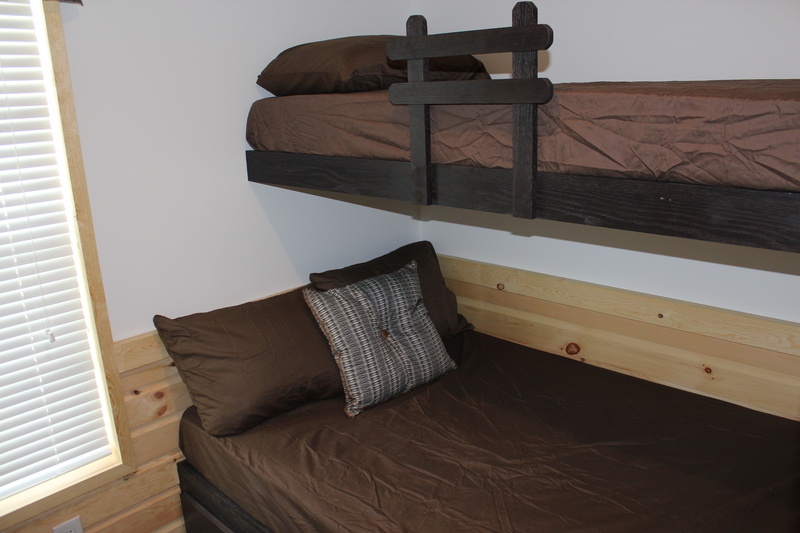 Our modern tiny house cabin living area has 1 queen bed in a master bedroom, and bunk bedroom with a full mattress & twin. Living room with chair & and a full sleeper sofa. 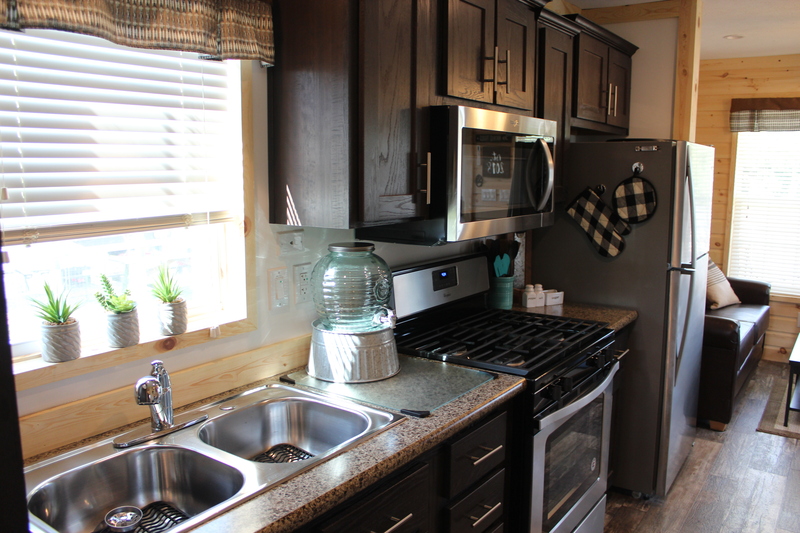 Full kitchen with a large refrigerator, gas stove, oven, coffee maker & microwave. 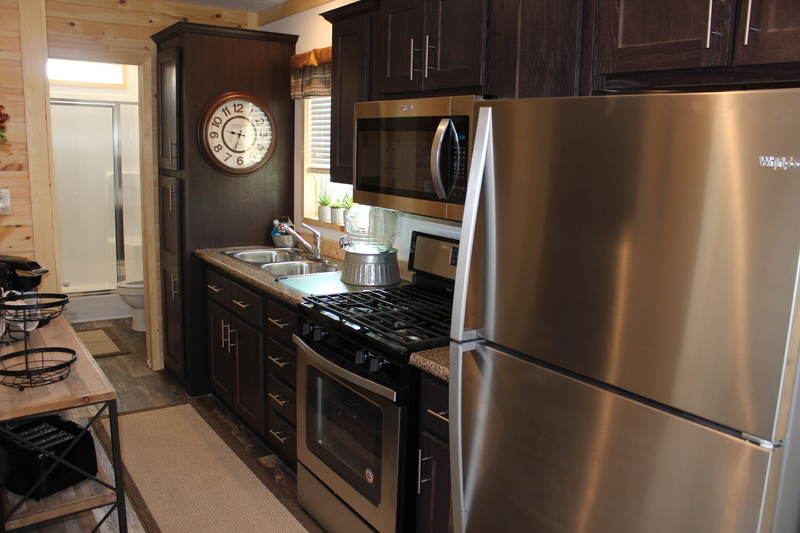 A minimally stocked pantry, and outside large gas grill, with side burner for your use. 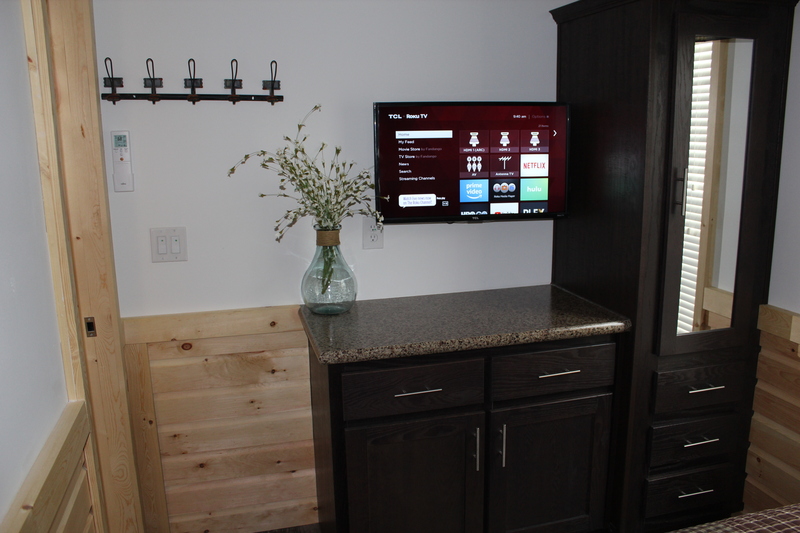 Electricity, water & sewer, 43″ smart television in the living room, 32″ in the bedroom with Netflix & Amazon Instant Video access, wireless internet, HDTV antenna with local channels. 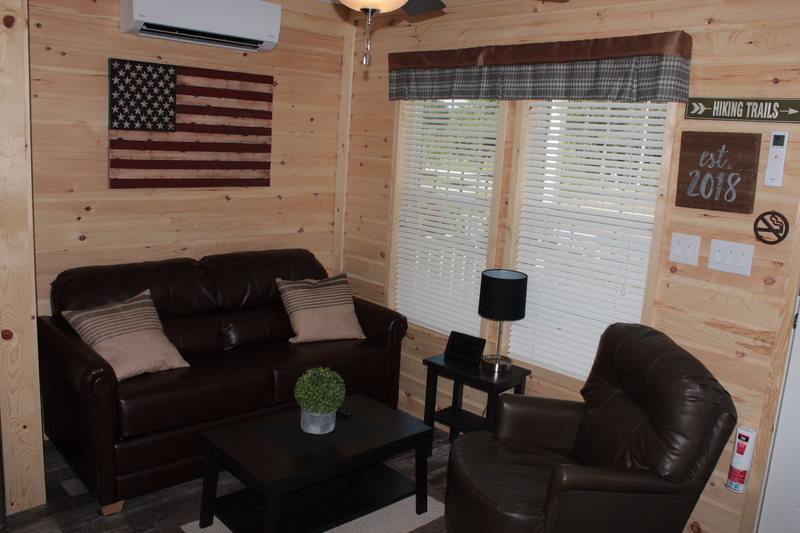 Cabin guests are able to access the entire campground, any weekend events at the campground & utilize the area around the cabin. I am always on Airbnb or mobile and can respond to any questions quickly, but don’t expect me to say in this modern tiny house cabin with you. On occasion, I stay in an RV at the park on the weekends too, but usually, I’m just 10 miles away from the cabin location. You will be provided with a special key code for entrance to my modern tiny house cabin, and your stay is private and alone. Want recommendations, or to hang out and drink a beer or two? Just ask, I will be glad to join you to show you a good time. 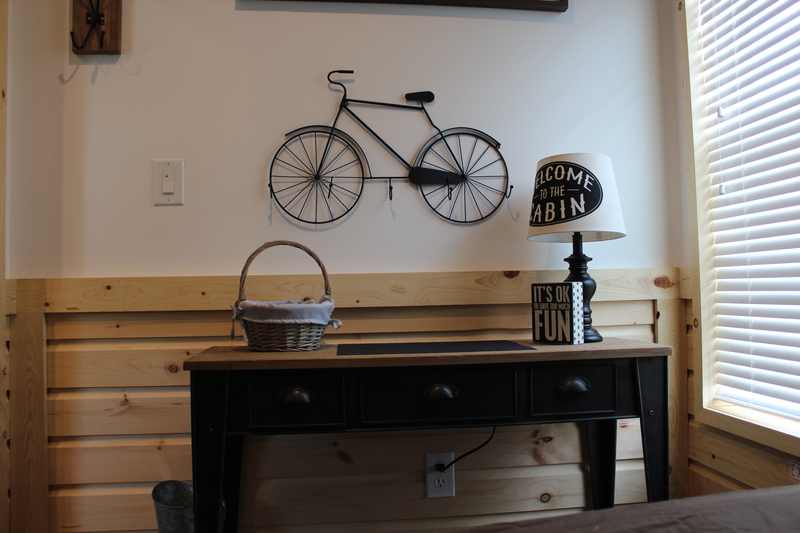 Cabin Clean Up: All guests are expected to clean this holiday home rental as when you arrived. Failure to leave this home will result in additional fees towards the security deposit. 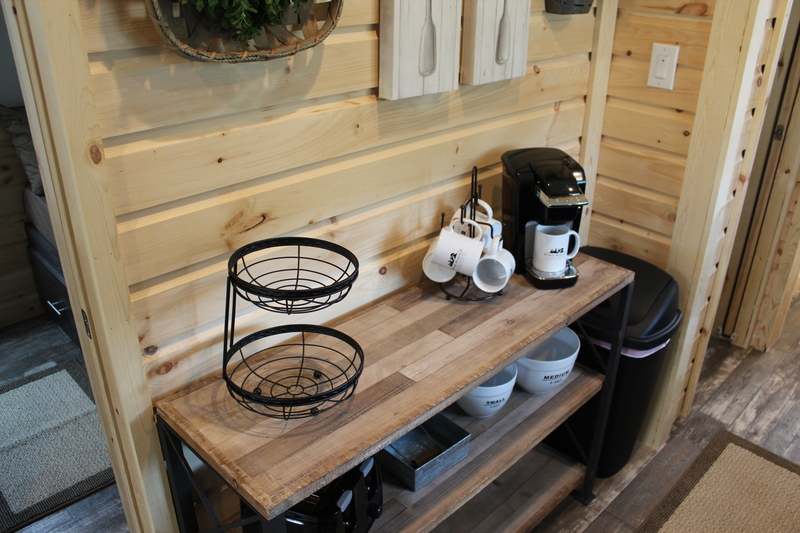 Fee: We charge a $45 cleaning fee for the cabin rental for your entire stay. Pets: Absolutely no pets are allowed to be brought to the tiny house cabin. Firewood: Outside firewood is not permitted for use in our campground. Firewood must be purchased from the campground, with your booking. Fee: We do a $20 load of firewood, which contains about 45-50 pcs. More additional options are available and must be paid with booking.